As part of our ongoing commitment to foster an awareness of authors’ rights among young people, ALCS is delighted to team up with both the National Literacy Trust and the CILIP Carnegie and Kate Greenaway (CKG) shadowing scheme. 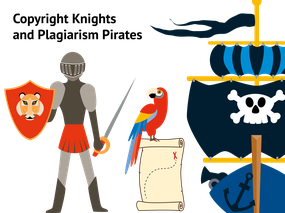 Copyright Knights and Plagiarism Pirates is our brand new writing competition launched in conjunction with the National Literacy Trust. The competition is designed to explain the challenging concepts of copyright and plagiarism to children in Key Stages 1-3 in a vibrant and memorable way. Resources accompanying the competition include a downloadable teaching pack, featuring fun ideas and activities to incorporate the competition into class time, and a downloadable certificate of achievement for children who complete the task. Become a Copyright Knight: Write a chivalrous code of conduct to teach people about copyright and help them understand why protecting creativity is important. Become a Plagiarism Pirate: Write a swashbuckling song explaining what plagiarism is and what happens to people who do it. Prizes for the best entries include £300 worth of books for the winner’s school, and two interactive storytelling theatre shows from Creative Education UK. The winning student will also receive book vouchers worth £50 and ten runners-up will each receive book vouchers worth £25. The National Literacy Trust work to improve literacy skills in the UK’s poorest communities, where one in three people have literacy problems. Last year, the Trust directly supported 108,198 children through their programmes in 3,685 schools and 143 early years settings. It also launched four research reports based on its annual literacy survey of 39,411 children and young people. ALCS is therefore delighted to work with the National Literacy Trust on this latest initiative. Entries for the competition must be received by 5pm on Thursday 31 May 2018. Here’s how to enter. In the week of the announcement of the shortlists for the CILIP Carnegie and Kate Greenaway (CKG) Medals, ALCS also launched its annual writing competition. 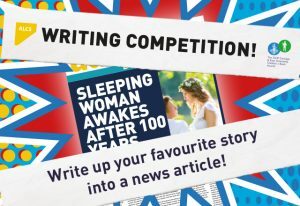 This competition is run through the accompanying CKG shadowing scheme. 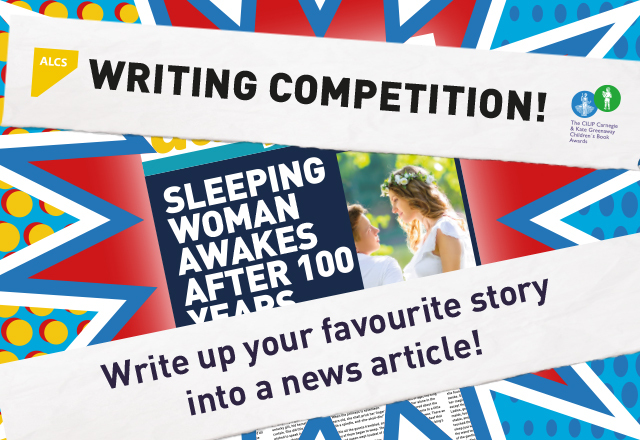 Participants are asked to write their favourite story as a news article, with the aid of a new classroom resource that outlines the basic principles of how to write a good news story. The competition aims to educate young people about the basic principles of copyright, linking creativity with ownership. 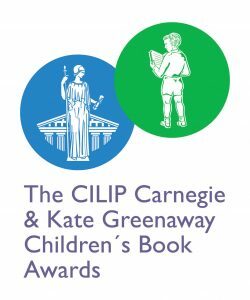 The winner will receive a tablet for their personal use, tickets for them and a chaperone to the CILIP Carnegie and Kate Greenaway Awards ceremony in London on the 18th June 2018, a selection of Carnegie and Greenaway shortlisted books, and £500 worth of books for their school library. The two runners-up will receive a selection of the Carnegie and Greenaway shortlisted books. Entrants must be signed up to the CKG shadowing scheme. Details of how to do this can be found on the CKG website. ALCS and CILIP have been in partnership for over a decade. The hugely successful CKG shadowing scheme reaches an estimated 100,000 children each year across the country. Participating children read the books shortlisted for the CKG Awards, discuss with each other which they think is the best, post reviews and vote for their favourite books before the official winners are announced. The CKG shadowing scheme is one of the UK’s major ‘reading for pleasure’ initiatives and is almost exclusively run as an extracurricular activity by English teachers and school librarians. For a full overview of the scheme’s success, read our 2017 anniversary piece, in which we celebrated ten years of supporting the CILIP CKG Awards and shadowing scheme. This year’s ALCS CKG competition closes on Friday 26 May 2018. Here’s how to enter. Read the CKG Awards shortlist press release here. Copyright: Do you know the basics?